This is one of the most important churches in Forio because San Vito is the patron saint of Forio. The church has very ancient origins, they say that it was founded in June 1306. In 1735 the enlargement works began, and in 5 years, they made the same appearance of it as we can see it nowadays . Towards the middle of the 18th century, the facade was redefined in pinnacle style with two bell towers covered in original way like a chinese hat. On the facade there is a panel depicting San Vito which was added only in 1881. The San Vito church has the largest church bell of the island made of the fusion of some cannons brought from Castel Nuovo, which the Bourbon King Ferdinand II gifted to the church in 1852. In July 1988 the church was promoted to the title of pontifical cathedral. A rare wooden polyptych dated back to the period between the 15th and the 16th centuries, fully repainted in the sixteenth century by Cesare Calise, is on the altar on the right at the entrance. On it there are the Madonna delle Grazie and the Saints, the Annunciation in the upper register, and the Crucifixion on the whole arch. The local artist, Montagano, signs the canvas of the second altar (1885), with the figures of St. Joseph, St. Nicholas, and San Rocco. A wooden statue of the Immaculate, dating back to 800, is placed here with another statue, present in the transept and depicting St. Anthony. On the side of the main altar you can find a Maddalena work of the painter from Forio Domenico Antonio Verde dated 1710, and on the left there is a Trinity with San Gennaro and Santa Cecilia of 1636 by Cesare Calise. Among the jewels in the Church of San Vito there is the largest altarpiece of the island dating back to 1745. Signed by Alfonso Di Spigna and lying on the main altar, it measures 4 meters by 2.65 and represents the Virgin in Glory with St. Vitus and St. Catherine of Alexandria with the Trinity up and a panorama of Forio down on it. Inside the sacristy there are two important works: the first one signed by Alfonso Di Spigna and represents a Pieta, the other one is among the most important works in the Basilica, a statue of silver and golden copper depicting San Vito in full figure. In his hands you can see a bunch of grapes according to the ancient legend that says that San Vito saved the island’s vines from a terrible plague. Sulfur prevented the tragedy and since then, every June 15, the statue is brought to procession on the streets of Forio. In honor of the patron saint the commune becomes full of people, events and stands before the June 15, preparing for the holiday. 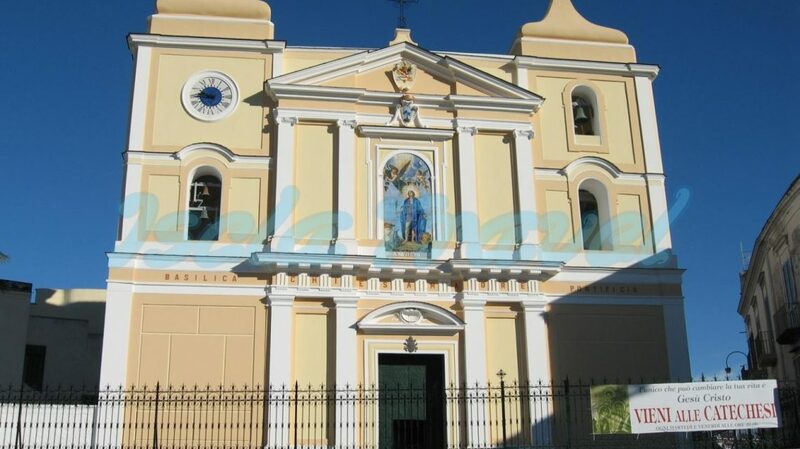 Do you want to visit "The church of San Vito" during your holidays in Ischia?